It was 45 years ago today that Buddy Baker broke the 200 MPH mark for a closed course with a stock-bodied car, driving a Dodge Charger Daytona past the mark at Talladega. It was an amazing event, and involved some corporate intrigue. Chrysler had come up with their winged cars - the Charger Daytona and the Plymouth Superbird - in 1969 and 1970 respectively and the cars were tearing up the big NASCAR tracks. At Talladega, qualifying speeds had approached 200 MPH but no one had crossed the magical mark. In February 1970, a promotions man from Dodge called one of the men in charge of the winged car program and asked if their car - one owned and tested by Chrysler - could run "official" laps at 200 miles per hour if given the opportunity on a good track with official timers. That man, Larry Rathgeb, didn't hesitate to tell him he was certain of it. After all, Charlie Glotzbach had run laps at Talladega of 199.466 mph in that car. Rathgeb realized that the cost would be minimal, and decided to see if Buddy Baker would be willing to give it a try between stops on the NASCAR circuit. Buddy agreed, so in the week following the Atlanta 500, Rathgeb, Baker, the engineering car, and some NASCAR officials gathered at Talladega to see if the 200 MPH barrier could be broken. They told everyone they were merely testing a new transmission, although some people were told they were testing tires. After all, Talladega ate tires for breakfast, so it was a feasible ploy. A press release put out afterwards claimed, "Buddy Baker was at Talladega for a series of engineering tests on transmission durability." Chrysler was concerned a little about the appearance of impropriety; after all, manufacturers weren't supposed to have such direct involvement in NASCAR. Hence, the transmission and tire alibis. The party arrived at the speedway a little after 8:00 the morning of March 24th. Among those present was NASCAR chief Bill France, along with Joe Epton, chief scorer for NASCAR. Baker took the car out for 5-lap circuits; the first lap to get up to speed and then three laps at speed to see how fast the car was and then a final slow-down lap to bring the car back in for adjustment. Between runs, the engineers and mechanics adjusted the suspension, fine-tuned the engine, and played with the tires to see what the perfect set up would be. "One of the first laps we ran in was 199.8 mph. And that was just warming up!" Baker noted later. After a few of the 5-lap runs, the team thought they had found the right tweaks to make the car its fastest. 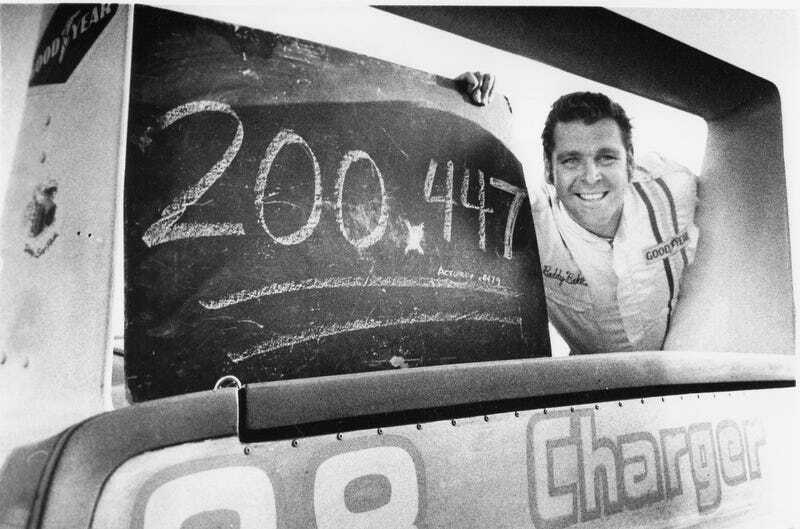 At 4:25 p.m. Baker ran a lap of 200.096 miles per hour, the first ever officially clocked by NASCAR at over 200. A few minutes later, he ran several more laps over 200, including one at 200.44795 miles per hour. After the runs, the crew posed with the pit board bearing the notation, "200.447." You can watch the run here. "For us it was just another day at the office. We were damn happy we did it, but it didn't seem like a big deal at the time. We had qualified close to 200 mph so we thought we could break the record," Rathgeb said. Still, Chrysler did not brag too loudly about their role in the operation. The press release that announced the record run was issued by Cotton Owens, the owner of Buddy Baker's race car – but not the car Baker was driving in the test. The release did not explain the difference, and claimed the record was set by Baker in "his Dodge Charger Daytona." Even the cover story on Stock Car Racing about the 200 mph run showed a picture of Baker behind the wheel of his Cotton Owens car #6 – not the Chrysler Engineering car. Chrysler let everyone else take the credit, knowing Chrysler would always be the underlying factor in the equation: none of this could have been done without the Dodge Charger Daytona. The record-setting trips around the track at Talladega paid big dividends as predicted in publicity. Champion, the spark plug maker, ran full-page ads in magazines with a photo of the car and the two-inch-tall caption, "200.447 MPH." The bulk of the text raves about the car and its speeds, but there are a few references to Champion spark plugs which were in the engine at the time. No NASCAR driver would qualify a car at 200 mph in a NASCAR event until 1982. It was at Talladega that Benny Parsons finally managed a 200.176 mph qualifying lap for the Winston 500. Steve Lehto is an attorney and writer and has an upcoming book on the Superbird and Daytona project at Chrysler which will be published by CarTech Books in January, 2016. He also handles Michigan lemon law. He wrote The Lemon Law Bible and Chrysler's Turbine Car: The Rise and Fall of Detroit's Coolest Creation. All photos (except for the Daytona/Superbird/Superbird photo - #2) courtesy of Greg Kwiatkowski.